Manchester Bombing Suspect's Father, Brother Arrested In Libya : The Two-Way Salman Abedi's relatives have been detained in Tripoli. In Britain, police arrested a total of seven people. "I think it's very clear that this is a network," the city's police chief says. A police officer stands on duty outside a residential property in Fallowfield, in southern Manchester, on Wednesday as investigations continue into the bombing at the Manchester Arena. In a statement posted on Facebook, Libya's RADA counterterrorism force said it had arrested and interrogated Abedi's 20-year-old brother, Hashim, on Tuesday. Libyan authorities said that for roughly a month, they had been watching Hashim, who they say had been about to launch an attack of his own in Tripoli. RADA also said their father, Ramadan Abedi, was taken into custody in Tripoli on Wednesday; he has been questioned but not charged. Salman Abedi, 22, died in Monday's attack at the end of an Ariana Grande concert in England. He was reportedly born in the U.K. to Libyan parents who had fled the regime of Moammar Gadhafi. He is believed to have returned to the U.K. from a trip to Libya recently. In a phone interview earlier Wednesday, Ramadan Abedi told the Associated Press that his son was innocent and that another of his sons, Ismail, had been arrested in England on Tuesday. News of the arrests came as authorities in England continue to investigate what they're calling a network behind the bombing at a concert that had drawn girls and teenagers to Manchester. Grande had been scheduled to perform in London this week, but her management team says she is canceling all shows through June 5. Early Thursday morning in Manchester, police carried out a controlled explosion while searching an address in the city's Moss Side area. They announced no reason for or result of the explosion. "I think it's very clear that this is a network that we are investigating," Greater Manchester Police Chief Ian Hopkins said in an update on the case. His remarks go a step further than previous statements, in which officials said they were trying to learn whether the attacker had the support of a larger group. "In some of my conversations that I've had with people who are following this very closely, the feeling is that they were aware of the bomber, but they didn't think that he had the ability to pull off something like this, something of such sophistication and something so effective and deadly." Manchester police say officers arrested six more people Wednesday as part of the investigation into the bombing, bringing the number of arrests to seven. The identities of those arrested and any charges against them have not been revealed. The first person was taken into custody on Tuesday in Manchester. Early Wednesday, police said three more men had been arrested "after police executed warrants in South Manchester" — the area of the city where the suspected suicide bomber is believed to have lived. Police carried out another arrest that evening in Wigan, in western Manchester, where police say they apprehended a "man carrying a package which we are currently assessing." 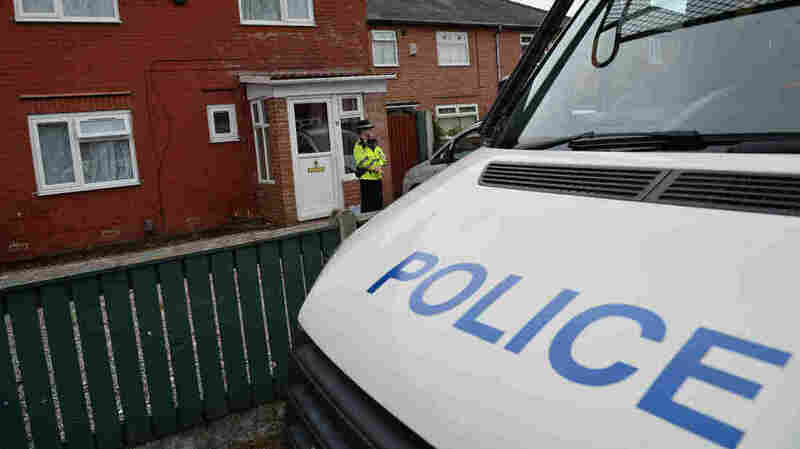 Police later announced they had arrested a woman in connection with the investigation in Blackley, a Manchester neighborhood. Police later said she had been released without charge. The arrest had come in the course of searches they were carrying out Wednesday evening. The seventh arrest came "at an address in Nuneaton, Warwickshire," Greater Manchester Police tweeted. Authorities also raided an apartment near the University of Manchester in the city center, where officers armed with automatic weapons blew open a door. "There's sort of ash and the smell of smoke," that resident, Adam Prince, tells Frank. "There's about eight officers sitting up there." In Monday night's attack, 22 people died and nearly 60 were sent to hospitals after an explosion struck in the area between the concert venue and the adjacent transit station. As of Wednesday morning, police say, they have identified all of the fatalities and contacted all of the families involved. Those killed in the attack, which targeted a concert by a pop singer whose core fan group is young girls, include 8-year-old Saffie Rose Roussos. Other victims who have been identified range from teenagers to a Polish couple, Angelika and Marcin Klis, who came to the venue to pick up their daughters. ISIS has issued a claim of responsibility for the bombing, but the level of the terrorist group's involvement isn't known. The U.K. is now at its highest terrorist threat level of "critical" for the first time since 2007. As part of the security response, military personnel are being deployed to civilian areas to work alongside and bolster police. The head of the U.K.'s National Counter Terrorism Policing unit, Assistant Commissioner Mark Rowley, says that using military troops "is part of an agreed and well-rehearsed plan and military personnel will remain under the command and control of the police service." "The investigation into the terrorist attack in Manchester is large-scale, fast-moving and making good progress," Rowley said. In London, police and security are being boosted, the Metropolitan Police Service announced Wednesday. Police are asking the public "to remain calm but alert" and to report suspicious behavior. "We will do all we can to protect the capital that we serve at this unsettling time," said Cmdr. Jane Connors, who leads the London policing operation. "All our work is designed to make our city as hostile an environment as possible for terrorists to plan and operate." "This tactic uses teams of specialist police officers who have been trained to spot the telltale signs that a person may be carrying out hostile reconnaissance or committing other crime. The approach is based on extensive research into the psychology of criminals and what undermines their activities." In a previous line in the story, a resident incorrectly identified the apartment that police raided as being rented on Airbnb. Airbnb said it was a private apartment for rent but not through the company.